Hi all! Today's OCC Challenge is themed "Crazy for Hearts! 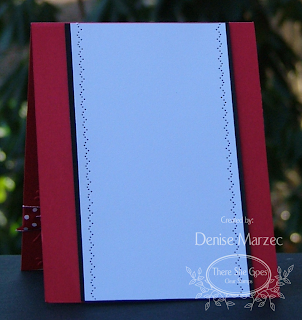 "...make a card with two or more hearts somewhere on your project. Before I get into the details of my card, I have a little announcement today. Some of you already know about this, but today will be my last post as an OCC blog team member. I need to free up my schedule a little bit so when Jennifer emailed us to see who wanted to sign up for another round of hosting challenges, I decided that this would be a good time to step down from the team. I'm not going far though...I still plan to participate in the OCC challenges when I can. I'll just be playing along as a challenge participant rather than a blog team member. Hugs to the OCC girls. I *HEART* you! !....get it?, it goes with today's challenge. Hehe! Now, onto my card... Silke was such a sweetie and gave me a bunch of the new Raspberry Fizz papers and ribbon to try out. Thanks, Silke!! I made the card for you, my friend. I hope you like it. The card measures 5.25" square. 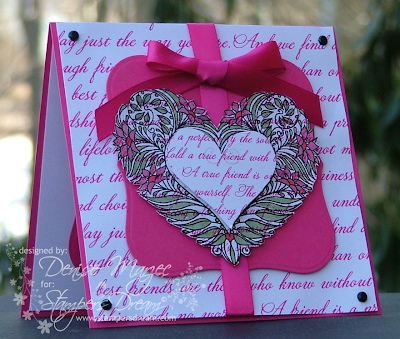 I stamped my new Leigh Hannan Garden Heart stamp from Stamper's Dream twice onto the PTI script DP, heat embossed it with black EP, colored the flowers and vines with my Copics, cut out the large heart and then cut out the inside heart, and popped them both up on Dimensionals. The bottom script panel and Labels One panel are also up on Dimensionals. There's a third heart on the inside of the card that was punched with my Creative Memories heart punch, which is also on Dimensionals. What can I say, I love puffy cards, LOL! Don't forget to check out all the heart projects from the OCC girls: Dawn, Lynda, Jackie, Silke, Kim, Laurie, Julee, Cindy, Amy, and Jennifer. Hi all! Here's a sneak peek of the new Flowers of Happiness set from There She Goes....I Love Love LOOOOOOVE this set...every single stamp...beautiful! The images on my card were all colored with Copic markers (colors are in the supply list below), and then I added some Celery and Golden Wheat Shimmerz to the leaves and centers of the flowers. There are more leaves and a flower on the inside too. To see more sneak peeks, click on these links: Jessica, Stephanie, Bev, Silke, Maki, Holly, and Faith. Reminder: There will be a chat tomorrow night in the Paper Craft Planet TSG group forum from 7 p.m. to 9 p.m. Pacific time. Jessica will announce the winners of all the Mini Set Giveaways...including one of YOU who have commented on the post below this one here on my blog. You haven't commented yet? ?...well, get on down there, LOL! You have until 7 p.m. Eastern tonight to enter. 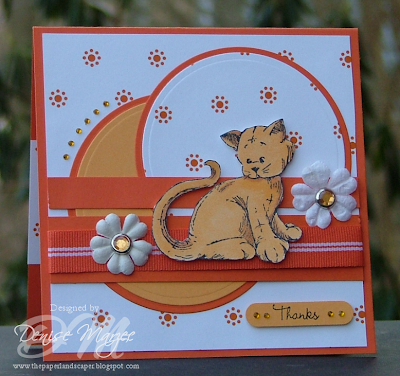 See you all tomorrow with my card for the OCC challenge. Roses & Chocolate...and a giveaway! 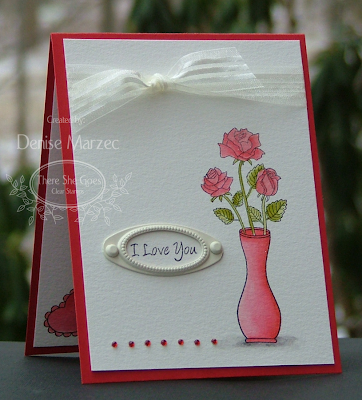 Roses & Chocolate...that's the name of one of the new stamp sets from There She Goes. It's a gorgeous set!! Just as yummy as it sounds! The GIVEAWAY part....well, just leave a comment here on this post telling me what your favorite chocolate treat is as well as your favorite color rose and you'll be entered for a chance to win one of the TSG mini sets...compliments of Jessica herself!! I'll use random.org to pick one of the entries on Friday night at 7 p.m. Eastern, I'll give the winner's name to Jessica, and she'll announce who won at the Live Chat that will be held on Saturday night from 7 to 9 p.m. Pacific time in the TSG Group on Paper Craft Planet! I wanted to keep the layout pretty simple on my card to really put the focus on the pretty roses and vase. I added some Candlelight Shimmerz to the image. On the inside of the card I stamped a heart in the lower left and right corners, connected the two hearts with some paper piercing, and added Candlelight Shimmerz to them as well. Here are links to some more Rose & Chocolate sneak peeks being shown today: Jessica, Stephanie, Bev, Silke, Maki, Holly, and Faith. I'll see you tomorrow with another TSG sneak peek card! Hi everyone! I finished all nine sketches for the Cupcake Anniversary celebration! Yay! This is going to be a long post with three cards, but these are the final three that I haven't posted to my blog yet. This one is Monika's sketch. I stamped my new MacBeth stamp twice, cut the second one out and popped it up on Dimensionals over the first one. The white circle and white scallop circle are each up on separate layers of Dimensionals as well. Next are some cards using the Magnolias that my buddy Terri sent me. The first one is Donna's sketch and I used the Cherry Tilda and Garden Chair image. Pretty cool of Terri to not only stamp these for me but mask them too! Thanks, Terri! All the panels were faux stitched with my SU mat pack, piercing tool, and a Brocade Blue marker. The main panel is up on Dimensionals. 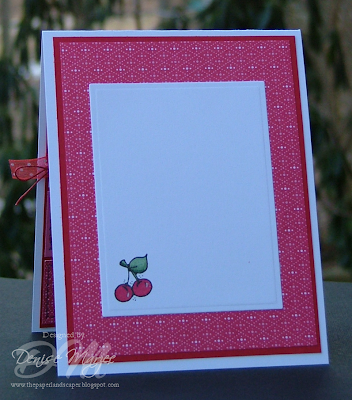 The adhesive bling cherries are available at both Taylored Expressions and at Stamper's Dream. On the inside of the card, I stamped my One Leaf Cherry stamp from Whipper Snapper Designs in the lower left-hand corner. 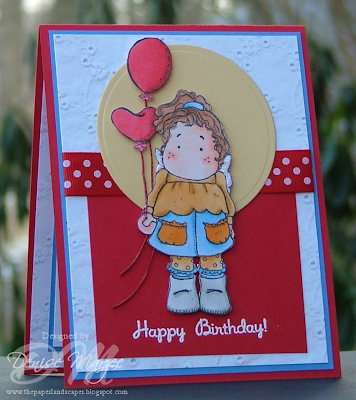 The next one is Jami's cupcake sketch and I used the Holding Balloons image from Terri. I cut out the Tilda image and balloons, popped them up on Dimensionals, and then ran some red waxed thread for the balloon strings behind the image. Diamond Stickles were added to her wings. The sentiment was heat embossed. The ribbon is from Taylored Expressions. Whew! If you made it this far, thanks for visiting!! Hi everyone! Stop by Jessica's blog when you get a chance. She just posted this month's TSG challenge that you all can play along in, AND, she's announcing the newest Guest Designer for There She Goes....Julie Lacey! Welcome, Julie!! I'll be back on Thursday and Friday to show you sneak peeks of Jessica's newest sets.....they ROCK!! You're gonna LOVE 'em!! Okay, so yesterday I said I'd be back today with another cupcake anniversary sketch...I'm back with TWO! The stamps I used are from the Sugar Nellie Home Grown Collection. The first one is Rory. He was stamped and colored twice. The second lion was cut out and popped up on Dimensionals. The layout is Stephanie's Sketch. The three rhinestones under the sentiment are Taylor's Tiny Twinkles. The next card is Sherrie's sketch and I used my Braveheart stamp. The cat and sentiment are up on Dimensionals. The Sunset Rhinestone Brads and Tiny Twinkles are available at Taylored Expressions. 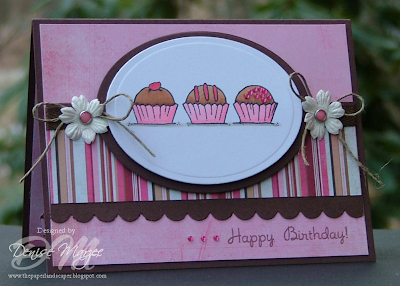 Here's a card using Vicki's sketch for the Cupcake Anniversary..and I used some more of Taylor's Tiny Twinkles. Don't forget, you have until tomorrow to take advantage of the SPECIAL Taylor is running on these cute little rhinestones! The stamps, DP and blush ribbon (valentine key ingredients), Prism paper, and Choice White CS are all available at Taylored Expressions. The curved mega Nestabilities panel is up on Dimensionals. There's a second cuppie that was colored and popped up on Dimensionals as well. All of the red and pink Tiny Twinkles were glued down with Diamond Glaze. The sentiment was heat embossed with white EP. I hope to be back tomorrow with another Cupcake Anniversary sketch! Here's a card with Ana Wohlfahrt's sketch for the Cupcake Anniversary celebration. I wanted to use this Sarah Kay Country Girl...look at her sweet face and those adorable little chicks running around everywhere....aww! It was stamped and colored twice. I cut out the girl from the second image and popped her up on Dimensionals over the first one. The white punched sentiment is also up on Dimensionals. The Neenah Solar White CS, Country Girl stamp, sentiment stamp, curved mega rectangle Nestabilities (inside of card), and adhesive-backed Chocolate Pearls are all available at Stamper's Dream. Michelle is currently at CHA (lucky duck, huh?!). While she's away she has some BLOG CANDY up for grabs on her blog....check it out! All you have to do for the chance to win is look at the sneak peeks from CHA and tell her three things you'd like to see her add to her store. Easy peasy! Jessica Knutsen's one-year blogoversary is tomorrow. 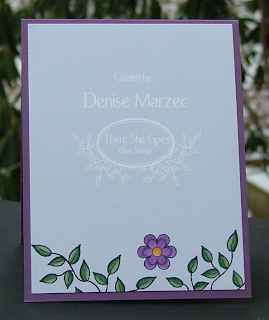 To celebrate, she's giving away THREE stamp sets from the There She Goes store. Check it out HERE on her blog! Hi everyone! Are you playing along in the Cupcake Anniversary sketches on Taylor's blog? Fun, Fun, FUN! If you haven't checked it out, head on over to her blog....NINE sketches were posted yesterday from Taylor and the Cupcake Crew. Here's a card using Taylor's Anniversary Sketch. 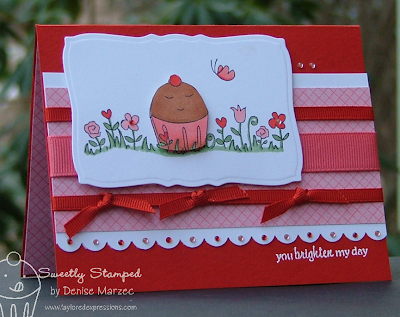 I used my Whipper Snapper Three Chocolate Truffles stamp (one of the first Anna Wight stamps I bought...still one of my favs!). 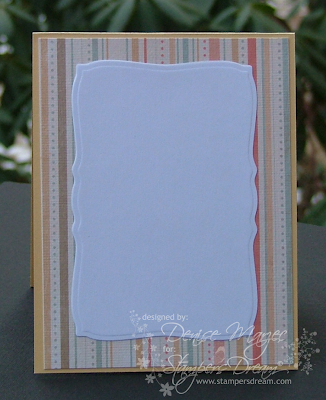 The stamped oval and cocoa mat oval are both up on separate layers of Dimensionals. See the tiny pink rhinestones on the truffle on the right and next to the sentiment? Those are Taylor's Tiny Twinkles.....I'm so excited they're BACK in stock!! Yay! These have been on my wish-list for a long time. The carousel-type container with over 400 multi-colored tiny rhinestones is just $3.99. From now through Wednesday, January 28th, Taylor is running a CHA Special: Buy 2, get 1 FREE!! You can also get free shipping on your orders over $40 during this timeframe, with this coupon code: FREESHIP0109 (all caps; zeros, not the letter O; no spaces). How cool is that?!! *sorry about the bad pic and how it looks sloped. I'd retake the pic, but it's now snowing outside...and I'm too lazy, LOL! Hope you're enjoying your Saturday! My card for today's OCC challenge is in the post below this one, just scroll down. I used one of the mini sets from There She Goes. I'll be back tomorrow with a Sarah Kay card using Ana Wolfhart's sketch for the Cupcake Annniversary. Hi everyone! 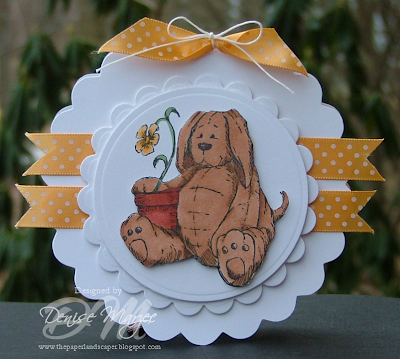 Jennifer has another sketch challenge today on Our Creative Corner. I used my new Thinking of You mini set from There She Goes (sentiment and flowers). The black scallop circles are up on Dimensionals. For more detailed info on all the OCC sample cards, here are links so you can do some blog hopping: Dawn, Lynda, Jackie, Silke, Kim, Laurie, Julee, Cindy, Amy, Jennifer, and our special guest this week is Carla (cmsuto on SCS)!! A Year of Cupcake Challenges!! Guess what today is?? Today is the official one-year anniversary of Taylor's Cupcake Challenges!! Happy Anniversary to Taylor and the Cupcake Crew!! To celebrate, EACH member of the Cupcake Crew has designed a sketch for today...that's a whole lot of sketches in one day for you to see!! Oh, and as if that wasn't exciting enough, there will also be PRIZES! Be sure to check out Taylor's blog, the anniversary celebration headquarters, for all of the sketch challenges as well as an awesome grand prize for one random winner who participates in ALL 9 sketch challenges. We hope you'll help us celebrate this yummy occasion! Jackie Pedro is one of the members of the Cupcake Crew and I was asked to be on her team of sketch samplers (I'm so excited!) along with Tammy Hershberger, Sharon Harnist, and Jenn Diercks!! You can check out the sketch on Jackie's blog and find out about the PRIZE you can win by participating. Here's my card featuring Jackie's sketch. I used stamps from the SASI Love is Sweet set, papers and embellishments from the Valentine Key Ingredients, and Taylor's new Choice White CS. The card measures 5.25" square. The matted main image and matted sentiment are both up on Dimensionals. The circle on the inside of the card is also up on Dimensionals. I realize now that I'm looking at the pictures...I should have been more careful with the direction of the striped paper. I have the stripes on the inside going a different direction than the ones on the front of the card. It probably would have looked better if the stripes followed the same direction. Oops, sorry about that....hope it doesn't make you dizzy, LOL! ..now go have fun with all the sketches and GOOD LUCK in the drawings! Hi everyone! Here are a couple sketch challenge cards. The first one is for today's SC212 sketch on Splitcoast. 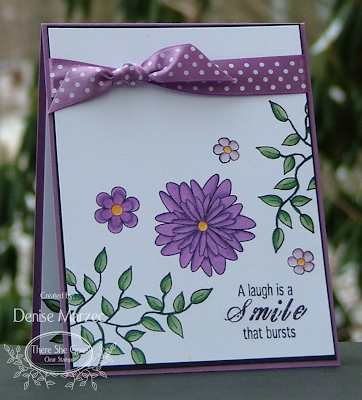 My friend Janice sent me these cute Sugar Nellie Daisy images....thanks Janice, the stamp is super cute!!. I colored two images, cut the second one out, and popped it up on Dimensionals over the base layer. The punched sentiment and the blue mat circle are also up on Dimensionals. The amber-colored gem in the center of the flower was given to me from my sweet friend Silke....thanks Silke, these are great!! The layout on the second card is SCS Sketch #208 from a few weeks ago...one that I hadn't gotten around to do yet. The adorable image was sent to me from my friend Lori....thanks Lori, she's just so sweet! The card measures 5.25" square. I used the Paper Tole technique on this image as well. The punched sentiment is also up on Dimensionals. That's it for today! Have a good one! 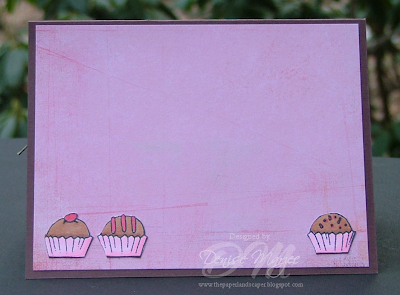 Here's a card I made for today's SCS Color Challenge (Regal Rose, Kiwi Kiss, Bravo Burgundy). 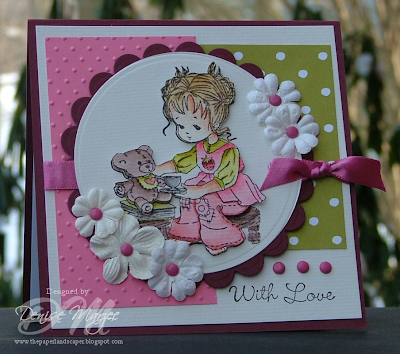 Have you seen these adorable Sugar Nellie stamps? Oh so cute! I bought this Strawberry Tea stamp as well as three of the CUTE animals from the Home Grown Collection. I can't wait to get them all inked up and made into cards. I followed sketch #11 from the Whiff of Joy blog....I know, I didn't use a Whiff of Joy image....it was a total accident. I printed the sketch days ago, added it to my bin of sketches, and forgot to write that it was from the WOJ blog (and should have been used with a WOJ image)...didn't realize it until after I finished my card and went to upload it to SCS. I hope the girls on the WOJ site don't mind. I really LOVE the sketch! The card measures 5.25" square. The burgundy scallop circle is up on dimensionals, so are the primas. The Strawberry Tea image was stamped twice, watercolored, and the second image was layered over the first one with Dimensionals. The inside of the card follows the same layout with the embossed Regal Rose panel, Kiwi DP panel, and layered circles. Hi everyone! Every month there's a challenge for the Dirty Dozen and Dirty Dozen Alumni. This month's challenge theme, hosted by the lovely Jodi Collins, is Can you Feel the Love. Restricted Element: No RED!! ....Yikes, Jodi! Pink is ok, but no red...again, YIKES Jodi! You don't even want to know HOW MANY times I reached for red, LOL! For the valentine/love-y theme, I used my Sarah Kay Fanny's Cuddle image. I used shades of pink and brown from my Bittersweet DP...whew, I stayed away from red. For the texture requirement, I dry embossed the large brown base panel with my Swiss Dots folder and heat embossed the sentiment. I also dry embossed the inside of the card. The main image and punched sentiment are both up on Dimensionals. Fanny's Cuddle, the With Love sentiment, Curved Mega Rectangle Nestabilities, Swiss Dots Embossing Folder, and the Neenah 80 lb White CS are all available at Stamper's Dream. The layout of the card is Taylor's TECC51 Sketch. Michelle was a sweetie and sent me some of these stamped Whiff of Joy images. Thanks Michelle! The cool layout is Mercy Kerin's Tuesday sketch from last Tuesday. The matted main image is popped up on Dimensionals, so is the prima in the upper right-hand corner. Diamond Stickles were added to Melinda's wings. The Gunmetal Stickles on the heart pillow.....well, that's a total cover up to an ink spot I got on the card after it was all glued down (#&@*!!). So, I had to get creative. 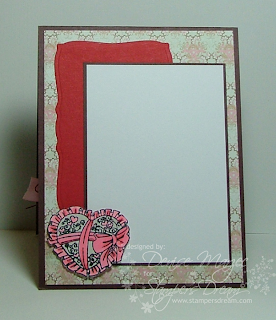 The inside follows the same layout as the front of the card, and the heart is up on Dimensionals. The Neenah 110lb CS, Whiff of Joy heart pillow and sentiment stamps, curved mega rectangle nestabilities, stickles, and adhesive heart gems are all available at Stamper's Dream. Just click on the links in the supply list below. Unfortunately, the Melinda Hugging Heart stamp is out of stock. Sorry about that! Yesterday I got all my ribbon organized. Just in case you'd like to see, here's how I have it stored. Half of my ribbon is hanging on Ribbon Rings that I got from Taylored Expressions. I love these things! They're even prettier now that they're out where I can see them (rather than in my closet)! I have the ribbon sorted on three different rings: greens, purples, and blues on one ring; reds, pinks, and oranges on another; neutrals on a third. I also hang my gold cord on the wall next to the ribbon rings. The other half of my ribbon is now in a drawer (pretty much next to the ribbon rings), but wound very neatly on old-style clothes pins. I did NOT come up with this idea, so I can't take credit for it. I saw it posted by Nichole Heady, and you can see her post HERE. Awesome idea!! I had the hardest time finding the old-style clothes pins, but then my friend Janice said I could find them at Dollar Tree. Sure enough, there they were...$1 for each pack of 20. I saw some on eBay too, but of course then there would be shipping costs. The ribbon is secured with some straight pins just like Nichole suggested in her post. I have to tell you, rolling ribbon this way saved TONS of space compared to keeping the ribbon on the rolls!! 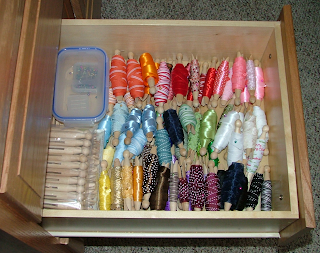 This drawer was TOTALLY jam packed with ribbon rolls before I changed over to the clothes pins. I mean, I couldn't fit ANYTHING else in there. It was messy too because the ribbon still unwound and the rolls were all uneven. Look at it now, there's room for A LOT more ribbon...guess I can go ribbon shopping, huh? Hehe! There's even room to store the extra packs of clothes pins and a container that holds the straight pins and tags for my Ribbon Rings. Oh, and I think I might get some sort of drawer dividers to keep the ribbon grouped by color family...because I know it won't stay this neat without them. Any ideas on what to get?